This pattern can actually be seen on the periodic table. If you look at the fourth period, the transition metals count ten across. In the sixth period, the rare earths count fourteen across. What is to be stressed is the “magic” number of eight. When an atom has eight valence electrons (in H and He’s case, two) it is considered more stable. Gilbert Newton Lewis devised a new model of the atom that stressed this full valence shell of eight electrons. Lewis was born in Weymouth, MA in 1875. Although home-schooled, he attended some school in Nebraska and went to Harvard, earning a PhD when he was 24. He worked at Harvard and later at MIT. 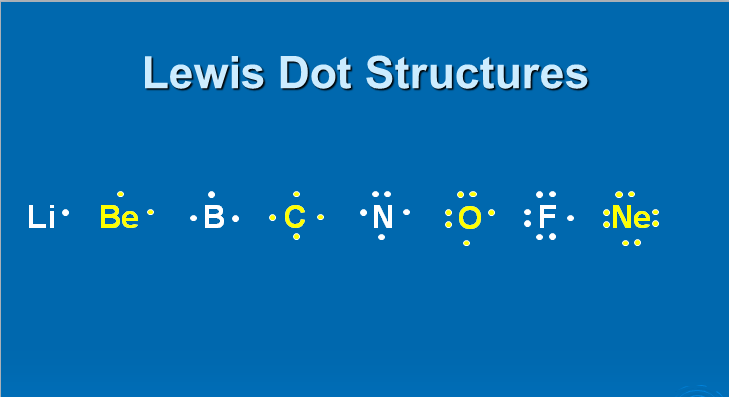 Gilbert Lewis developed the Lewis Dot Structure (LDS) and this is a very useful tool in analyzing if and how atoms bond. 1. Everything about the atom except its valence shell is represented by the atomic symbol. This includes the # of protons, neutrons, and all the inner electrons. 2. The valence electrons are represented by dots that can be placed on one of the four sides (top, bottom, right, left) of the symbol. 3. You fill up the sides, one dot at a time. You may not put two dots together until there is one dot on each of the four sides of the symbol. 4. Sides that have zero dots and those that have two dots are unavailable to bond with other atoms. 5. Sides that have one dot on them are open bonding sites. They can bond with other atoms. 6. An atom is stable when it has either zero or eight dots around it. The order of the dots does not matter as long as each side has one before they are doubled. In other words, the dot representing the one valence electron for lithium could be found on top, the left side, the bottom, or as is written here, on the right side. Looking at these dots quickly tells you the number of bonding sites that each element has. Lithium has only one, beryllium two, boron three, carbon four, nitrogen three, oxygen two, fluorine one, and neon zero. The electron dot structures are the same for every member of the family. Every member of the nitrogen family has five dots representing five valence electrons. It also means that they need three more electrons to become stable. One can even see a pattern to the valence number for each family. • One dot represents a valence number of 1+, meaning that the atom loses one electron to become stable. There is only one open bonding site. • Two dots represent a valence number of 2+, meaning that the atom loses two elec­trons to become stable. There are two open bonding sites. • Three dots represent a valence number of 3+, meaning that the atom loses three elec­trons to become stable. There are three open bonding sites. • Four dots represent a valence number of 4±, meaning that the atom loses or gains four electrons to become stable. There are four open bonding sites. • Five dots represent a valence number of 3-, meaning that the atom gains three elec­trons to become stable. There are three open bonding sites. • Six dots represent a valence number of 2-, meaning that the atom gains two electrons to become stable. There are two open bonding sites. • Seven dots represent a valence number of 1-, meaning that the atom gains one elec­tron to become stable. There is one open bonding site. • Eight dots represent a valence number of 0, meaning that the atom gains or loses no electrons to become stable. There are no open bonding sites.